As many of you faithful Hollywood2020.blogs.com readers know Club Penguin has been the subject of some of our most popular posts. 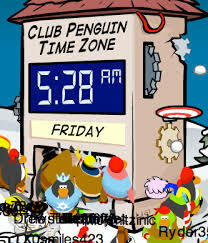 Blogger Joyce Schwarz is a big fan of Virtual Worlds espcially ones that are run as well as Club Penguin. So it's fascinating to see Disney move ahead and acquire Club Penguin for $350 million in CASH! of the fastest growing online destinations for kids ages 6-14.
furnish a virtual home with currency earned inside the game. comfortable letting our own children visit."